At a workshop in Delhi last year, during the UnBox Festival, I posed the following question to a group of 20 design, transport, and city development professionals: What new products, services or ingredients are needed to help a cycle commerce ecosystem flourish in India’s cities, towns and villages? The answer was: a lot – and it’s not just about the bikes. We discussed the need for an online catalogue of products and business models to aid decision-support. We learned that micro-finance for independent vendors should be a priority. Traffic architectures, hygiene regulations, and disinterest of municipal authorities, were an obstacle. Opposition from place-based retailers was an issue. Topography, and climate, could not be ignored. As the to-do list grew, the scale of the challenge seemed ever more daunting. But a strange this has happened. The obstacles we identified in Delhi seem less daunting today than a year ago. Something big is afoot. 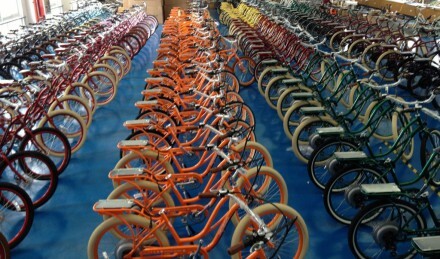 E-bikes in China are outselling cars four to one. Their sudden popularity has confounded planners who thought China was set to become the next automobile powerhouse. In Europe, too, e-bike sales are escalating. Sales have been growing by 50% a year since 2008 with forecasts of at least three million sales in 2015. I have the strong impression that a cloud of discrete but related developments is converging. In the background, a combination of energy costs and economic insecurity adds urgency to the need for change. At street level, myriad innovations in hardware, systems, and business models are giving us the component parts of the ecosystem we yearned for in Delhi. A profound transformation to the mobility profile of modern cities no longer feels like a dream. A small project in Vienna first persuaded me something big is afoot. I heard by chance about a piece of software that answers the question: Will riding my bike from point A to point G make me sweat? A small firm called Komobile have developed a decision support tool that will calculate the amount of nutritional energy the human body will need for a prospective trip by regular bike, or e-bike. Their project, su:b:city (suburbia:bike:city) is part of a broader drive in Austria to promote e-bikes as ‘range-extenders’ to conventional bikes and increase two-wheeled commuting. The idea is to combine information about the mass of the vehicle – including its cargo, and the mass of the rider – with data about the inclines, detours, and headwinds that increase the rider’s body energy consumption. With this information to hand, riders can determine in advance whether the external energy provided by the electric motor on a pedelec is needed. The topographical data needed already exists in many digital maps. As one of Komobile’s designers, Martin Niegl, explained it to me, Isohypses points of equal altitude; joined together, these points become the wavy black lines on maps we use when walking across country. Transport planners also use isochrones to denote lines of equal travel time. Komobile’s innovation is add isoenergetes – lines that denote of equal energy consumption into a geographical information system (GIS) for metropolitan Vienna. The idea is to inform a rider how much effort will be needed climb steep hill sides in the western part of the city, for example. For an unassisted cargo bike, this is crucial information: Inclines impact on their operating distance. Komobile then discovered a missing piece of information: headwind speeds that might be encountered along the way; on a heavy bike, these can be just as taxing as inclines. In Vienna, Kopmobile located a source real-time wind speeds in the city’s meterological office, only to learn that such measurement devices are located ten metres above the road surface. To be accurate, real-time wind-speeds at surface level are needed. A platform that can collect windspeed data in real-time from small devices around the city has been added to the to-do list. Komobile’s next task is to persuade city managers to embrace calory-planning with the same confidence that they now plan time and space. Lightening up the movement around cities of cargo movements is the ideal place to start. Enormous amounts of energy are wasted shipping objects from place to place. An example from The Netherlands: Of the 1,900 vans and trucks that enter the city of Breda (pop: 320,000) each day, less than ten percent of the cargo being delivered really needs to be delivered in a van or truck; 40 percent of van-based deliveries involve just one package. An EU-funded project called CycleLogistics calculates that 50 percent of all parcels delivered in EU cities could be delivered by cargo bike. Cargo-bikes need not be limited to lightweight packages. As Kris de Decker discovered, fast, two-wheeled cargo cycles have a load capacity of up to 180 kg (396 lbs); slower vehicles with three or four wheels can easily take 250 kg (550 lbs). Using a tandem configuration and/or electric power assistance can raise the load capacity even further, to about half a ton. As Ivan Illich pointed out in Energy & Equity, in 1973, the metabolic efficiency of a human on a bicycle is remarkably good. Measured in terms of calories expended by the traveller, the conventional bicycle is by far the most efficient means of human locomotion. To travel one kilometre by bike requires approximately 5-15 watt-hours (w-h) of energy; the same distance requires 15-20 w-h by foot, 30-40 w-h by train, and over 400 w-h in a car with one occupant. According to ExtraEnergy’s tests over several years, an average pedelec uses an average of 1kWh per 100km in electricity. A car with an internal combustion engine uses fifty times more – at least 50 kWh per 100 km. Translated into money, the difference is astonishing. It costs less than a penny per mile to ride an electric bike or scooter. A car, by comparison, costs fifty times more – $0.54 per mile according to the American Automobile Association once license costs, insurance, registration, maintenance and other costs are factored in. Once all system costs are included, a cargo cycle can be up to 98 percent cheaper per km than four-wheeled, motorised alternatives. Some e-bikers reckon that electric bikes can have a smaller environmental footprint even than pedal-only bicycles when the energy costs of the food needed to power the rider are added. If the rider eats a typical western diet, about ten times more primary energy goes into the production of her food than is absorbed by the body when the food is eaten. Our metabolisms convert food energy into work with a conversion efficiency of about 25%. The net result? For every unit of human energy used to pedal a bike, about 40 times that much was expended upstream. Even including the energy needed to manufacture and recycle the batteries, e-bikes end up consuming from two to 10 times less fossil fuel energy than their human-powered equivalents. They may be cheap – but are they clean? Even if e-bikes are fifty times more efficient than a car per kilometre travelled, is the energy used to power an e-bike clean? Critics charge that if hundreds of millions of pedelecs were to be charged from the grid, the result will be more emissions because such a large proportion of the energy comes originally from dirty power stations. Policymakers in Austria are addressing this very real difficulty, too. They are deploying fiscal measures that incentivise pedelec users to use only renewable energy. In 2011, for example, a national subsidy for the purchase of company pedelecs was approved, so long as the company used only verifiably eco electricity. What about the batteries? Probably 80% of all e-bikes sold around the world use lead acid battery packs (they are called ‘battery bikes’ in China) – but these are indeed a sub-optimal solution. Quite apart from the toxicity of battery production, the weight of lead needed to propel a bicycle for a decent 40-50km range is a disincentive to regular use. From a sustainability perspective, lithium-ion cells are the better solution. Their high energy density means that only a lightweight pack is required. Trouble is, lithium batteries are expensive, and some sceptics warn of an imminent lithium shortage; lithium is the fossil fuel of the future, they say. The favoured solution to the battery conundrum in Europe is to change the business model. Hiring a battery should be cheaper than buying one, but at the moment extraction of lithium is still cheaper than recycling, so manufacturers have no incentive to invest in take-back. They make more money selling them as consumables. A ban on battery sales would reverse these perverse incentives. Anticipating this switch, the Swiss company Biketech supplies pedelecs without batteries; the rider hires them hired for around e15 per month. ExtraEnergy anticipates that this price will stabilise at about e12 a month in the medium term. A shift to e-bikes is not just about reducing energy and cost; as a system, they can support huge numbers of livelihoods. Service providers and artisans were heavy users of cargo cycles during the first half of the twentieth century and now – as jobs disappear, and transport costs rise – myriad small-scale traders are rediscovering neglected models, and reinventing them using today’s new tools. As I have seen and marveled in India over many years, bicycles enable a huge number of livelihoods in the formal as well as informal economy. An an e-bike can enable tradesmen, artisans and service providers to start a business with a much lower investment, and to operate it at considerably lower cost. Although cargo bikes are far less expensive than buying and running a van, they are still prohibitively expensive if you’re starting up as a self-employed trader. In the global south, where a lack of finance is not a new problem, a variety of financial innovations has emerged to meet this need – from bicycle micro-credit in Rwanda to the donation of recyled bikes to poor citizens in Chile. In Lagos, small traders, having founded their own credit system, now have their own banks. Many citizens packages to move do not need to own an cargo e-bike – but could still use one from time to time. To deal with that issue,the LastenRad Kollektiv, in Vienna, rents out cargo cycles to individuals who want to transport something big or heavy and prefer not to use a car. And in Israel, a platform called Tel-O-Porter makes goods trailers availableas an addition to existing bike-share schemes. Tel-O-Porter’s customers right now tend to use it for groceries and running errands, but it the system rugged and durable enough for work-related transportation, too. The largest online forum, endless-sphere.com, boasts more than 13,000 topic threads and some 221,000 posts. This treasure trove of hands-on innovation will show you how to build e-bike packs from hacked apart power tool batteries, or invite you compete to make making the lightest, most powerful, or cheapest e-bike. The scope of endless-sphere is constrained to some extent by language – it’s all in English – but here, too, a solution is in the works: plans are afoot to build a pan-European blogging platform in multiple languages. The e-bike movement also aspires to extend its embrace beyond the young and fit. Creative ways to engage car-bound doubters crop up everywhere. In Tanzania, free lessons in cycling skills are given to refugees.In Albania, bikeless citizens are serenaded by a movement called Shining Cycle Culture. In Llubljana, whose citizens seem to dislike getting their hands dirty, a network of repair shops is being developed. Worried that your costly e-bike will be stolen? In Germany, a new ChargeLockCable system combines charging with theft protection at the same time. The system is being tested in three pilot regions: Tegernsee, Schliersee and Achensee. What about the proliferation of different technical solutions; will too much diversity limit the e-bike movement’s ability to scale? There are 73 different charger plugs out there, for goodness sake. Fear not: The Germans are on to that, too. Design work on a standardised power connector – a USB plug for e-bikes – commenced in 2002 and electrical, data protocol and mechanical definitions were published in 2011. Nine years to design a plug! The commitment driving this movement is wondrous to behold. What about space? Won’t e-bikes compete with with cars and pedestrians ands their numbers multiply? The Dutch are showing the way on that one. They’re building a national network of 16 bicycle expressways at a cost of e80,000,000. The design specificatjon includes no junctions or traffic lights; smooth asphalt; four metre wide lanes to aloow for easy overtaking; wind barriers on bridges; there’s even roofing on particularly exposes stretches. The new bike routes are integrated with public transport interchanges. Every city’s mobility ecosystem contains a multitude of economic actors: freight businesses; taxi drivers; courier companies; retailers; hotels and restaurants; emergency services; street traders. How on earth is a city to persuade all these actors to head in the low-calory direction signalled by e-bikes? In response to this challenge, a number of innovations in governance are emerging. The EU’s GoPedelec programme, for example,runs Municipal Decision Maker Workshops in Austria, Germany, Hungary, The Netherlands, Italy, and the Czech republic. At each session local officials get to try out a pedelec, and learn about the hard and soft aspects of pedelec-friendly infrastructure. Best practice from other regions are shared at each event. In Denmark, a programme called Kickstand Policy Training helps diverse groups of local stakeholders work towards a shared vision for cycling. Kickstand’s two-day courses bring together professionals from planning & design, local government, traffic engineering, urbanism & architecture, public health, tourism, economic development, neighborhood & community groups, businessa associations, real estate interests, law enforcement, and school boards. These northern examples have much to learn from more rooted governance innovations across the global south. A process called ‘Multi Actor Ecosystem Participation’, for example, has emerged from efforts to improve the shared governance of land, water, forests, and grasslands. In the Sahel region of Africa, too, a reforestation system called Farmer Managed Natural Regeneration (FMNR) led to the development of a training programme on “Facilitating multi-actor collaboration for sustainable resources management”. As the writer Robert Neuwirth reminds us, diverse, fragmented economies are more resilient than hyper-connected global ones, Neuwirth reminds us. Economic power in the developing world contains millions of the small-scale businesses, family farms, local traditions, and extended social and regional networks. that resilience experts are advocating as novelties here in the North. They may or may not be part of the legally recognized economic structure, he says, but “what happens among all the unregistered street markets and roadside kiosks of the world is not simply haphazard.It’s a product of intelligence, resilience, self-organization, and group solidarity. It follows a number of well-worn though unwritten rules. It is, in that sense, a system”. Your numbers on human vs. bike efficiency come from a 2004 college term paper. The assumptions are flawed and the numbers are rounded and cooked. For a better treatment, seen my book, The Laws of Physics Are On My Side (2013).